What better way to enjoy a grilled chicken meal than with the fresh, sweet tastes of homemade raspberry vinaigrette and luscious grilled peaches? Preheat grill to medium-high heat. Brush grill grate with oil. For the salad, toast almonds in a nonstick skillet over medium heat until golden. Add sugar and butter, then season with salt; stir until sugar dissolves and coats almonds. Transfer almonds to a plate to cool. Whisk together oil, vinegar, ¼ cup raspberries, honey, tarragon, and shallots, then season with salt for the vinaigrette. Set aside half the vinaigrette to marinate the chicken, reserve remaining vinaigrette to toss with the salad. For the chicken, pound chicken breasts, one at a time, in a resealable plastic bag to ½-inch thick. Toss chicken and ¼ cup vinaigrette in a bowl; marinate chicken in refrigerator for 15 minutes. Combine honey and oil; brush on peach halves. Remove chicken from marinade. Season chicken with salt and pepper. Grill chicken, uncovered, until cooked through, 3–4 minutes per side. Grill peaches until lightly marked, about 3 minutes per side. Toss salad with remaining vinaigrette just before serving. 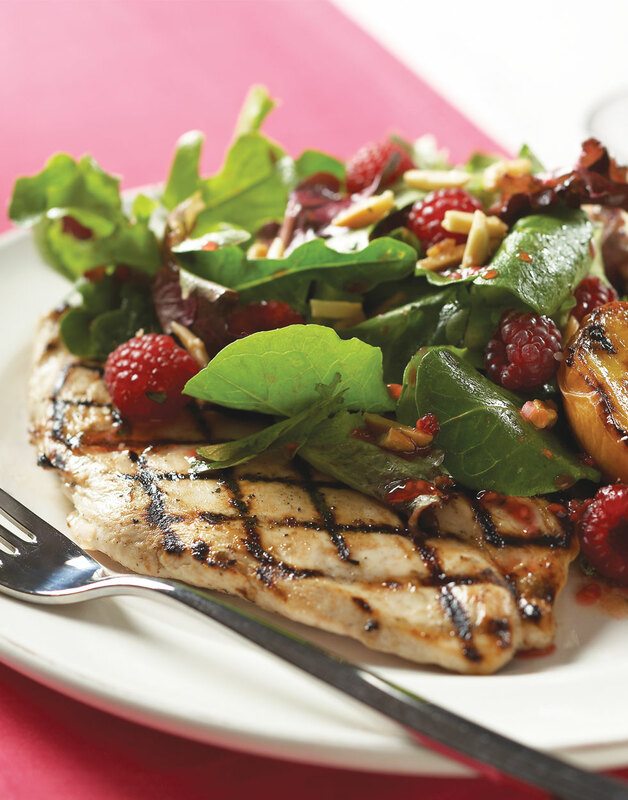 Serve salad with chicken, peaches, glazed almonds, and remaining 1 cup raspberries. Lightly toast the almonds, then glaze them in butter and sugar. Remove almonds from heat and let them cool completely. Combine vinaigrette ingredients, lightly crushing raspberries with a whisk while adding the oil. Because the chicken is so thin, be sure to watch it closely so it doesn't overcook and dry out.